It is midmorning on a rainy Wednesday, dank and clammy along Essex Street, and handwritten script on a sidewalk sign promises comfort from the concrete city: "Dim Sum." Through the door, up two flights of stairs and into a wide room at Chau Chow City, and suddenly: steaming tea and rolling carts and quick scratches on an order ticket. Fried taro with pork. Stuffed shrimp bean curd. Sticky rice wrapped with lotus leaf. More tea. A dozen or more tables are busy with customers, and every one is Asian. They chat in hurried debate and hushed tones, in Cantonese, in Mandarin. They read newspapers printed in Chinese. Chopsticks click against plates as voices rise and fall and pages turn - it is, for an outsider, immediate immersion. Since soon after the first Chinese immigrants arrived in the 1880s and pitched tents on Ping On Alley, just around the corner from Chau Chow City, Chinatown has been a pulsing place, set snugly near the center of Boston. Today, Chinatown has, on average, more older and more younger people than other parts of Boston. They live in closer quarters - twice as dense as the city average - and are poorer, by more than half, with an average annual income under $15,000. The dismantled Central Artery has brought the openness of the Rose Fitzgerald Kennedy Greenway, but also high-end developers to Chinatown's edge. It evolves from the inside, too, as new immigrants from regions across China and other parts of Asia continue to change the dynamics of the long-settled community. Approach from the south, along Interstate 93, and Chinatown's nestled network of streets are hidden, bounded at one end by the wide walls of Tufts Medical Center, the neighborhood's largest landowner, and at the other by financial towers. 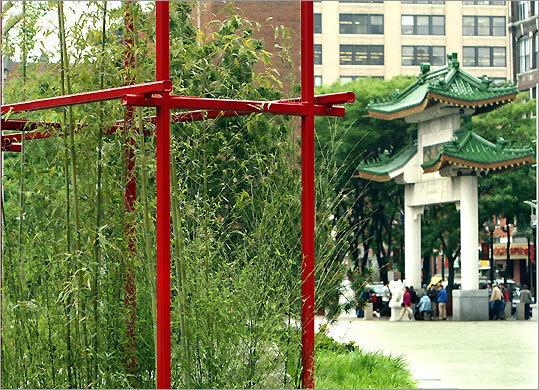 Chinatown's formal entrance is on the east side, where a high, green-topped gate leads onto the bustling commercial heart of Beach Street. Men gather beneath the gate on sunny days and banter as fingers fly above chess boards. On one weekday afternoon, Zhen Fei Zhang, 70, stood by a game table wearing a khaki jacket, blue slacks, loafers, and a "Boston" baseball cap. "It's a fast-moving game," Zhang said, speaking in Cantonese to an interpreter. "You wait for the other guy to make a wrong move." Zhang taught chess at a middle school in his native Guangzhou, a booming metropolis in southern China, and a hotbed of the game. He followed his grown son to Boston after retirement, four years ago. "Chess is very good for practicing your logic, to prevent against Alzheimer's, to exercise your brain," Zhang said. Two blocks south along Hudson Street, there is little action near an empty grass lot. The street had been a home to a community of its own, but decades ago the east side was cleared to make way for highway construction. Now a piece of land vacated when the Central Artery came down is slated to be developed by the Asian Community Development Corp. Plans call for hundreds of units, at market rate and subsidized. It will return life to an area long silent, as most housing in Chinatown rises south and west, in towers such as Tai Tung Village, on Oak Street. On a spring morning, Caroline Chang, president of the community development organization, sat in the small office of the Chinese Historical Society of New England and recalled the ambience of the more intimate era of her Chinatown childhood. "I don't know if we can recapture it," Chang said. "But when we were kids . . . we used to hang out on doorsteps until someone shushed us." To connect to street life today, try angling toward the commercial core of the neighborhood, bordered loosely by Essex, Kneeland, Tyler, and Washington streets. Especially on warm days, there is still the intimacy of a village. Old friends sit on milk crates on the sidewalk in front of Maxim Coffee House and share tea and talk. Workers queue for rides in vans to jobs in Chinese restaurants in Quincy and other outlying areas. Vendors unpack vans and sell vegetables curbside. Restaurants anchor much of the action here, of course, and to stand on Beach Street and spin among the options can be overwhelming. It is best to explore. For pork and leek dumplings, it's worth a stop at Gourmet Dumpling House, a snug but bright room, a relative newcomer. For more classic atmosphere, and the relentless lists of dishes, including seafood from the tanks by the door, settle into Peach Farm Restaurant, or East Ocean City. Compare the fried squid, excellent at both restaurants, though Peach Farm's spicier version wins for tenderness and taste. Some restaurants have diversified to include other Asian cuisines, including Southeast Asian, Korean, and Japanese. Xinh Xinh, set behind a small storefront near other Vietnamese restaurants, makes a fine spot for a bowl of pho, the traditional noodle soup. If there is an epicenter of all this food, it is perhaps one of the least assuming, if most well-positioned locales: Ding Ho. Inside, there is one small aisle for ordering, a small kitchen behind the counter for cooking. A lunchtime line forms quickly, with medical staff in scrubs standing alongside construction workers to pay a few dollars for styrofoam containers heavy with lo mein, fried rice, barbecue chicken, and more. During one noontime rush, a delivery man wheeled a sack of onions behind the counter, as Ling Ho, 53, took a break from frying vegetables. Eleven years ago, Ho left a job as hotel manager in southern China to move to Boston. His two children have since graduated from area universities, but Ho continues to work in a lesser job than he had in China. "Even though life in China is better, the population is too large. Competition is too hard," he said. "There are always going to be people looking for opportunities to get out." Ho said he does not regret the move, but misses the cultural vastness of his homeland. "It's like coming from a really big city, where you can get everything you desire, and then moving to a small town," he said. China's tastes, though, have traveled well, and those looking to cook with small-town authenticity can stop by Wings Live Poultry for fresh ducks, geese, chickens, and more. Or walk the aisles of C-Mart Supermarket for noodles, fresh produce, shelves of spices, and tanks of live seafood. Jewels shimmer in storefronts nearby, and other shops sell music and DVDs of recent Chinese films. For physical remedies, turn into Nam Bac Hong Chinese Herbs in the shadow of Tufts Medical Center. Shelves are lined with traditional treatments for everything from allergies to headaches to cancer. Most customers are Chinese, particularly newly arrived immigrants. Roughly one-third, though, are Western, looking for other approaches to a healthy life. "Chinese medicine has a history of thousands of years," owner Patrick So said. "With time, there are always changes, but . . . even with tall buildings, things stay the same." It is a short walk from Nam Bac Hong back to the gate. On Sunday, Aug. 17, the streets along the way will be full of vendors and dancers for the annual August Moon Festival. For several evenings in early September, crowds will gather in a vacant lot nearby for Films at the Gate, an open-air showing of kung fu and classic Chinese-language films. But most days, there will be the routine bustle beneath the gate that spreads on the wide plaza of the greenway. Beyond, the park passes through a narrow bamboo garden. It is slight and simple, red metal frames around green shoots, with a waterfall feeding a narrow stream. Yet the passageway transports quickly, and only a few steps into the high-rise surrounds of the financial district, it is hard to imagine all that is left behind. Tom Haines can be reached at thaines@globe.com. By appointment, $15 per person. Scheduled for Aug. 2, Sept. 6, Oct. 4; adults $15, students and members $12. Aug. 17, 10 a.m.-5 p.m.
On and around the Beach Street commercial area. Sept. 3-7 evenings. Near 10 Hudson St.